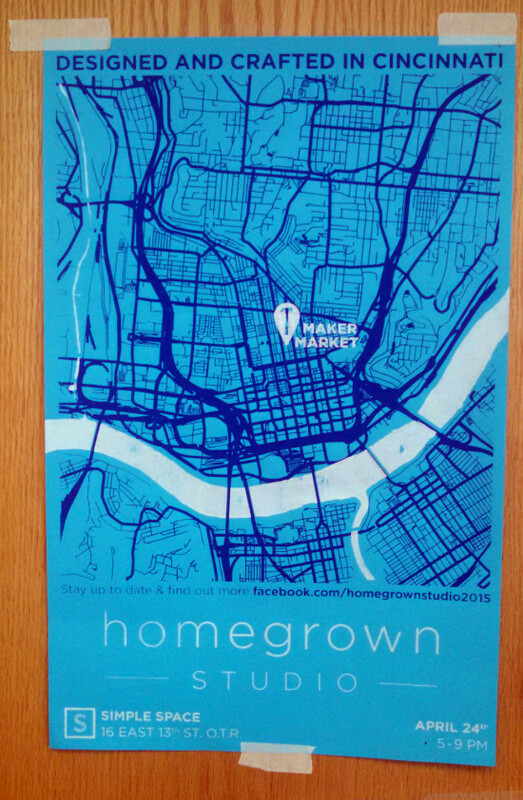 Spotted this map while out and about yesterday (…and quickly appropriated it for the geography grad office). People I don’t know making maps?? WHHAAAAT? How exciting! And screen-printed no less. As everyone may or may not know, there’s no obvious and standard ontology in the world of cartography and map data, meaning that each dataset has its own way of describing and encoding the objects of the world. Its own familiar quirks. I was able to pick this out as OSM data by the too-thick blotches in the railyard, where I remembered I had failed to properly classify some of the shorter segments. Cool colors are areas with more dead-ending street segments and warm colors indicate more connected streets than otherwise. That big top blob is Dayton, the lower Cincinnati sitting on the Ohio River. Disconnected streets simply cancel out connecting streets, so you can sort of consider this corrected for density. Since most streets connect to others at both ends1, the inverse of the above map doesn’t show much that the first one didn’t. It’s interesting to note the distinctly different patterns here. Clusters of connecting streets, many of their more intense appearances in gridded arrangements, form relatively distinct places. You can easily make out Hamilton, Middleton, Richmond or Oxford in the first map if you know where to look. 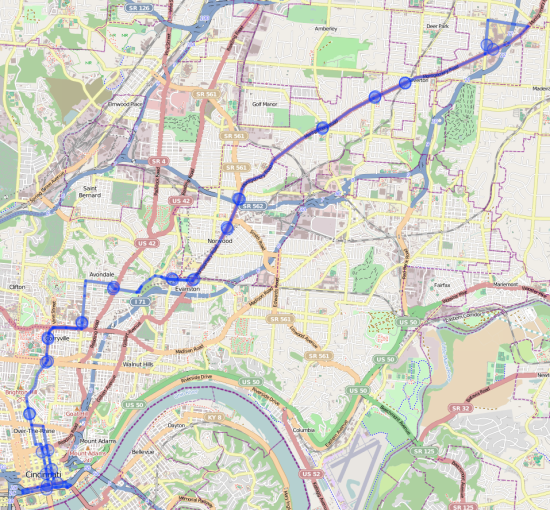 The disconnected streets though seem to really blur recognizable places, totally changing the shape of Cincinnati and smearing it into Dayton, a visible connection not so apparent in the first map. What’s going on in Kentucky? The rural area south of Cincinnati is a lot hillier than that to the North and there are a lot of long streets that branch out along the tops of hills and then end where the hills themselves do. In flatter places, such streets would pretty naturally just continue straight on until they met the next road. Since you’re probably wondering if you made it this far just what counts as a connecting street, it’s a segment that connects to another at both ends. In fact, here they are below. You’re gonna want to click the image for the full resolution. Red is connecting, blue unconnected. 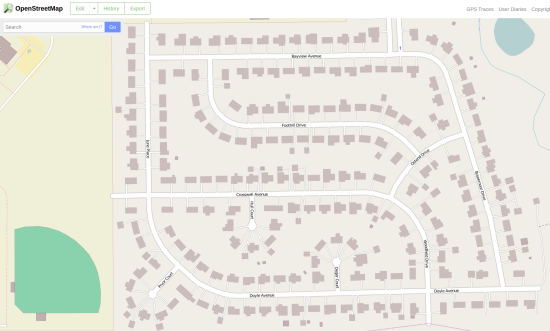 Create a routable topology from OSM data using osm2po. Compute a kernel density surface using the centroids and weight values. I used an 8KM radius, and tri-weight kernels with the QGIS raster plugin which I think is simply a GUI for GDAL. Some very long dead-ending segments appeared around the edges as a result of clipping the original dataset out of it’s global context. Concentrating their weight in a centroid resulted in strongly negative spots which simply shouldn’t exist. Lines that turned back on themselves, or sub-networks of streets which where ultimately connected to the main network by only one edge, and which may thus reasonably be considered entirely dead ends were not identified at all. OSM data in the US is mainly derived from low-quality TIGER data that was imported several years ago. Many rural areas seem to have an enormous number of driveway type paths identified, many of them mislabelled as residential streets. There are also some places where actual suburban driveways have been identified as dead-ends, which may or may not be misleading to some degree. Most of these however are very short and so their weight shouldn’t be overwhelming. Though that huge negative area West of Dayton is Brookville, where someone seems to have added driveways for every house in town. There’s a new bus in town! Check out the route, including all the stops on OSM. I’m told by a friend who’s ridden it a few times from Downtown to UC that it’s significantly faster than the alternatives though I haven’t had a chance to verify that myself. The m+ comes about every 15 minutes Monday through Friday, early morning through almost 10pm.